I’ll be the first to admit it. I love cereal. Like, sometimes I would buy a box of Reeses Puffs and hide them so that I could eat it in the evening after the kids have gone to bed and maybe wait until Jonathan was in the shower…. I know, I’m a horrible person. But if I let the kids eat it, we’d be done with the box in one sitting. So, really I was just trying to stretch a dollar…right? Anyways, I haven’t done that for a while now. In fact, I’ve been trying to find something my kids would like to eat in the morning that is quick, doesn’t involve me cooking, and is they can do on their own. But, it has to be healthy. Then I found this recipe by Two Raspberries. I’ve modified it to fit what our family likes and I'm telling you, it's so tasty. So, if you’re ready for your house to smell like Christmas morning, make sure you have these ingredients on hand! Ok, got it? Let’s get baking! First, dump your oats in a bowl. Then add your cinnamon, salt and chopped up nuts. Mix all that together. In a small pan over the stove, melt coconut oil and add your maple syrup. Once it’s all melted together add vanilla and mix it into your oats. Spray a baking sheet with coconut oil and spread out a thin layer of the oat mixture. Bake at 350 degrees for 12 minutes. After 12 minutes, get it out and use a fork to mix it around then pop it back in the oven for another 12 minutes. 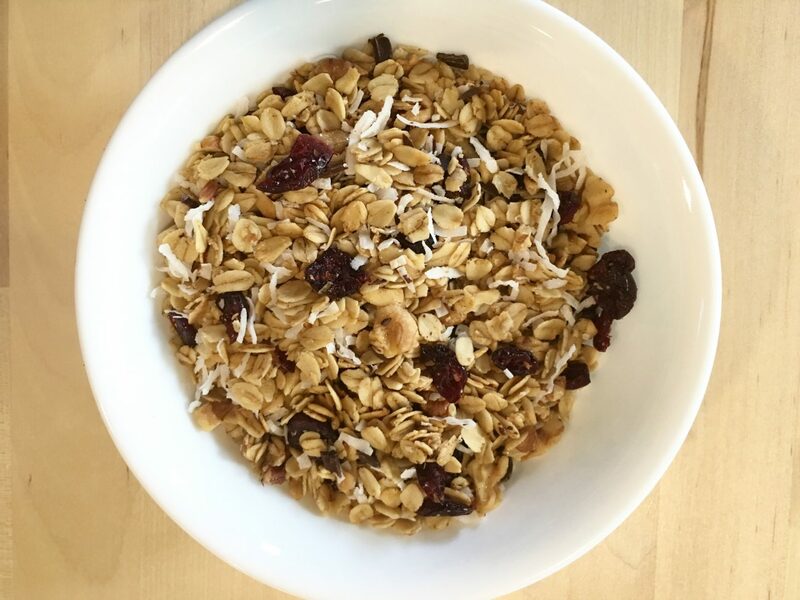 Dump the oats into another bowl that has your dried cranberries, cherries and unsweetened coconut flakes. Mix it all together and let it cool completely before adding in your chopped dark chocolate. Store in an airtight container and enjoy with fruit, or on yogurt, or as cereal. ** If you have the time, toast your coconut first. It doesn't take long (about 3-5 minutes in the oven) and the flavor is even better with the toasted coconut. We love this granola and now I make it every week. I double the recipe and it lasts us about 5-7 days! I hope you make it and see for yourself how easy it is and how amazing it tastes. I’m pretty certain it would be amazing on ice cream when you get it right out of the oven. I may have to try that next time!